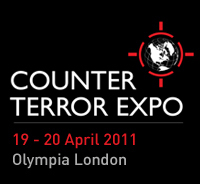 The world's leading Counter Terror Expo will be held on the 19 - 20 April 2011 at London Olympia. 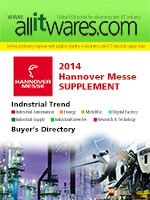 The event which is headline sponsored by Thales brings together governmental agencies, security services, law enforcement, leading specialists and technologists for two days of high level debate against a backdrop of an extensive exhibition and over 90 free to attend workshops. Police, Home Office, Inteligence Services, MOD, Armed Forces, Transporation, Border Control, Civil Defense, Customs, Central and Local Government, Customs, Civil Defence, Systems Intergrators, Critical National Infrastructure, Corporates. Profile for exhibit includes CBRNE Detection and Protection, X-Ray Equipment, Access Control, CCTV and Surveillance, Biometrics, Blast Containment, Communication Systems, Emergency Response Equipment, EOD/ROV, Location and Tracking. Perimeter and Intrusion Detection, RFID, Tracking, Seals and Tamper Evident, Special Vehicles, Personl Protection Products, Training Services.